On Saturday 9 June, in solidarity with LGBT+ people in York and around the world, we were delighted to support York Pride - for the fifth year in a row. Members of the public signed cards addressed to the Prime Minister of Finland - calling for a fairer system for transgender people there. 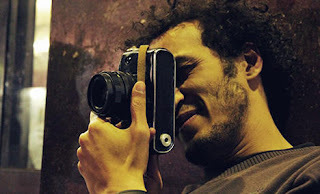 Shawkan is a photo-journalist. His photographs have been published in many newspapers (including the Sun) and magazines (including Time). He has been in prison for five years, after he took photographs of a protest in Egypt. We call on Egypt to release him. We are pleased to present an exhibition of eighteen photographs that Shawkan took in Cairo during political upheaval between 2011 and 2013. They depict daily life and the tense political atmosphere. The exhibition takes place at York Friends Meeting House, Friargate, York, YO1 9RL. We launch the exhibition with a special event on Friday 22 June from 7.00 to 8.30 pm. Rachael Maskell (Member of Parliament for York Central), Liz Lockley (from York Human Rights City) and Hugh Sandeman (Amnesty International UK's co-ordinator for Egypt) will speak, refreshments (including hot drinks and biscuits) will be served and those who attend will get to see the exhibition before anyone else. The exhibition will stay on display in the foyer of the Friends Meeting House (which is also known as the Quaker Meeting House) until 2 July. The opening hours are: from Monday to Thursday, 8.30 am to 9.30 pm; and on Friday and Saturday, 8.30 am to 5.00 pm. The exhibition is part of a world-wide campaign by Amnesty International to raise Shawkan's profile - so as to increase the likelihood that he will be released. People who visit the exhibition will have the opportunity to sign a letter to the Egyptian government. We invite everyone to see the exhibition and attend the launch event. Our next monthly meeting takes place on Tuesday 12 June at the usual venue - York Friends Meeting House, Friargate, York, YO1 9RL. We do not have a guest speaker so the meeting starts at 7.30 pm. Everyone is, as always, welcome to attend.